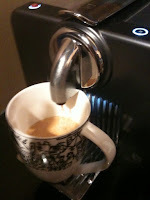 On The Run Blog: Finally... A Morning Run then Double Espresso! Finally... A Morning Run then Double Espresso! My morning runs have been pretty much non-existent these days, not to mention my daily runs. However, this morning I pulled myself from the clutches of the bed, laced up my shoes, and head out at 5:30am for a pretty good run. I had forgotten how dark it is here in Atlanta. There aren't too many street lights and even fewer cars so the darkness is near black with shadows cast from the moonlight if you're lucky enough to have a clear sky. This morning was relatively clear, with a good moon overhead so I could see enough to make my way down the deserted streets. My day has been amazing since that run. It started off with a great double espresso and egg sandwich. Plus, my energy level has been off the charts (and it is usually pretty HIGH). I'm sure my coworkers wish I wouldn't take to the streets again tomorrow morning, but I don't think I can help myself! Online Training Logs - Which One Should I Use? Rest Day = More Tour de France Time!